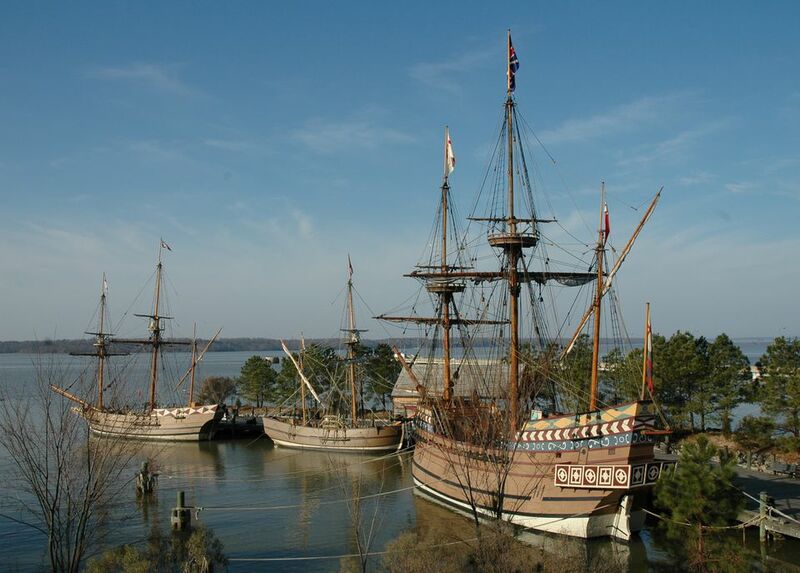 Jamestown, the site of the first permanent English settlement in America, is a major tourist attraction and an interesting place to visit in Virginia. In 1607, 13 years before the Mayflower arrived at Plymouth Rock, a group of 104 Englishmen began a settlement on the banks of Virginia’s James River. The story of Jamestown’s founders and the Virginia Indians they encountered is told at Jamestown Settlement through gallery exhibits and outdoor living history museums: a re-created Powhatan Indian village, replicas of the three ships that landed in 1607, a representation of the colonial fort, and a riverfront discovery area that explores waterway transportation and commercial activities. Jamestown Rediscovery, a separate destination, just down the Colonial Parkway, preserves the original settlement site and features an Archaearium archaeology museum and active excavations. Jamestown is located between Route 31 and the Colonial Parkway; adjacent to Colonial National Historical Park and six miles from Williamsburg, ten miles from Interstate 64, Exits 242A and 234. Indoor Galleries: An introductory film, “1607: A Nation Takes Root,” is shown at regular intervals providing an overview of how the Powhatan Indian, English and African cultures impacted the Jamestown Settlement. Exhibits include portraits, documents, furnishings, toys, ceremonial and decorative objects, tools and weapons, and hundreds of Virginia archaeological artifacts. Powhatan Indian Village: After viewing the indoor exhibits, visitors arrive at the Powhatan Indian village, an outdoor re-creation of a site once inhabited by Paspahegh Indians, the Powhatan tribal group closest to Jamestown. The village consists of several houses made of sapling frames covered with reed mats, a garden and a ceremonial dance circle. Historical interpreters discuss and demonstrate the Powhatan way of life. They grow and prepare food, process animal hides, make tools and pottery, and weave natural fibers. Jamestown Riverfront Discovery Area and Ships: From the Powhatan village, a path leads to a pier where replicas of the three ships that transported the original Jamestown colonists to Virginia in 1607 are docked. Visitors can board and explore the Susan Constant, Godspeed and Discovery and talk with interpreters about the four-and-a-half-month voyage from England. There are periodic demonstrations of piloting and navigation, cargo handling and sail making. James Fort: This area serves as a representation of the colonial settlement during 1610-14, reflecting its predominantly military and commercial character. The fort includes dwellings, an Anglican church, a court of guard, a storehouse, a cape merchant’s office, provisioning areas and a governor’s house. Historical interpreters forge and repair metal objects in a blacksmith’s forge and, near one of the fort’s three bulwarks, show how matchlock muskets are fired. Seasonally and periodically, interpreters also cultivate food and tobacco crops, produce wood products using 17th-century-style tools, and demonstrate domestic activities such as sewing and meal preparation. Hours: Open 9 a.m. to 5 p.m. daily year-round, Summer hours until 6 p.m. (June 15 through August 15) Closed on December 25 and January 1. Admission: $17 adults; $8 children ages 6-12. Combination tickets with the American Revolution at Yorktown Museum: $23 adults, $12 ages 6-12. 1368 Colonial Pkwy. Jamestown Rediscovery’s archaeology brings to life the stories of early James Fort. The site is administered jointly by Preservation Virginia and the National Park Service. Walking tours are available from park rangers April through October. Visitors can explore the archaeological site and the Archaearium archaeology museum and learn about the more than 2 million artifacts that have been discovered here. You can also walk the trails, observe wildlife and enjoy a picnic on the banks of the James River. Hours: Grounds 8:30 a.m.-4:30 p.m. Visitor Center 9 a.m.-5 p.m. Museum 9:30 a.m.-5:30 p.m. Closed on Thanksgiving, December 25 and January 1. Admission: $14 adults, includes admission to the Yorktown Battlefield. Jamestown is a part of what’s known as America’s Historic Triangle, including Colonial Williamsburg and Yorktown. The historic region makes a great getaway destination and is conveniently located just a few hours south of Washington, DC.